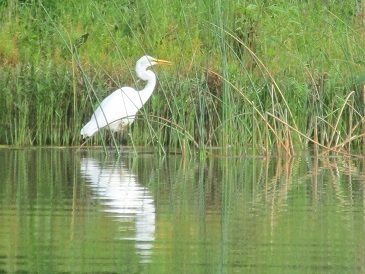 This lovely creature blessed our early-morning kayak outing on Labor Day, flaunting its bleach-white feathers against the late-summer greens. 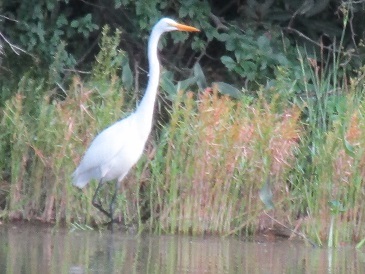 I followed him down the edge of the lake for a few minutes, trying to get the bird in flight. Unfortunately, my camera only got the sky. As someone who sits behind a computer screen for much of the day, I envied this guy’s ability to stretch his neck straighter to see whatever caught his attention down yonder. Sometimes I wish I could look down yonder to see what pitfalls or dangers may lie ahead on the path I’ve chosen. I’d like to see the outcome for choices made today. I guess it’s good to stretch ourselves a little, but like this guy, what’s really most important is seeing what’s in front of you right now.